A month before C.J. Walker set up Farmers & Merchants Bank (OTCQB: FMBL) on November 23rd, 1907, he had been a director at First National Bank. Ructions in the New York stock market had created a sense of fear around the safety of customer deposits, and so before it opened on October 12th, 1907, Walker had $500,000 worth of gold bullion transported by rail and horse drawn wagon to the bank and stacked up against the windows. When the crowds entered he assured them that any depositor at the bank could elect to be fully refunded in gold bullion should they so choose, and that the bank would remain open until all depositors were satisfied. These were the Wild West days of banking and capitalism – before the various deposit protection schemes that today give us some peace of mind were even dreamt up. Over the course of the day apparently none took up the offer to withdraw their cash such was the confidence inspired by Walker’s and the bank’s approach to the run. A month later he set up Farmers & Merchants Bank of Long Beach on the same conservative and customer orientated principles. Farmers & Merchants Bank is one of the strongest banks in the country, as measured by a variety of industry standards. We continue to uphold the philosophy of our founder, C.J. Walker, that “safeguarding our clients’ money is a sacred trust,” and giving back to the community is the wisest investment a business can make. It says a lot about the fractured nature of the US banking system that you can get these tiny regional banks like Farmers & Merchants Bank of Long Beach with decades of consecutive dividend payments behind them. When other banks were going under in the Great Depression, or in any of the numerous busts and downturns we’ve had since, these conservatively managed local institutions just kept chugging along. To get a feel for how conservative the lending here is in the last full financial year the bank only saw six loans delinquent over thirty days out of a total loan book of over 3,000, with no loan loss provision in the year before that. 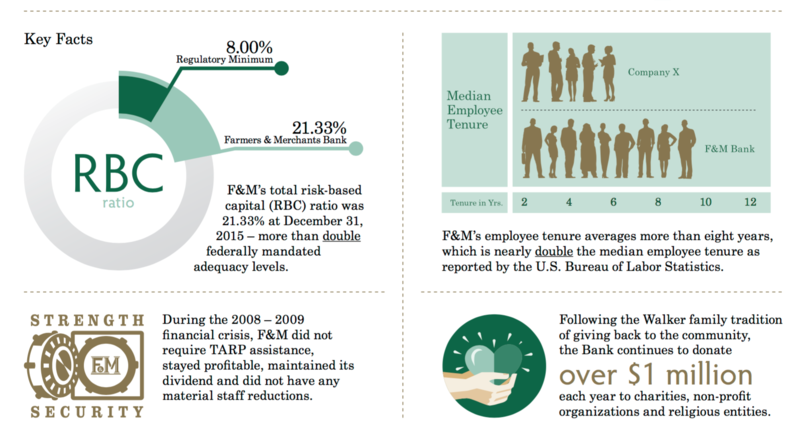 Their total risk based capital ratio is around 2.5x the Federal mandated minimum requirements. They remained profitable during the 2008-09 financial crisis and maintained the dividend, as they have done now for 488 consecutive payments stretching back to 1916. The last time they cut the dividend? Apparently never. It has survived depressions and numerous recessions; stock market crashes; regulatory and technological changes. Yet the dividend has always been paid out on time every quarter (and often with a special payment made at the end of each year). Over the lifetime of 99.99% of the population investors have never seen a dividend cut: it’s an absolute cash cow. With that in mind it probably won’t surprise you to hear that the stock is incredibly tightly held. According to Bloomberg the average volume is just eight shares a day. Eight. On a current share price of around $6,300 that makes the daily trading amount less than $50,000. For a company with a market capitalization of around $1bn that figure is insane. The funny thing with F&M Bank of Long Beach is that it actually appears to be undervalued most of the time despite its obvious high quality. Maybe it’s down to not splitting their shares, and the resultant high stock price and total lack of meaningful liquidity, but it’s quite surprising given how strong the bank is. Its returns haven’t been too bad either over the past decade or so. Imagine purchasing $100,000 worth of stock back in 2003; which on a stock price of $3,160 per-share would have netted you about 31 shares at the start of the year. The annual forward dividend for that year was $64.00 per-share – giving you a yield of 1.73% on paper. However the bank have a history of paying out a special dividend alongside their normal fourth quarter payment (as far as I can see they’ve done it in every year since at least 2001). For 2003 that special dividend amounted to $21.00 per-share, which in practice would’ve bumped your initial forward yield to the 2.30% mark. The company reported earnings-per-share of $299.60 per-share over the first year you own the stock, meaning you were paying a little over 12x forward earnings to start with. By fiscal year 2015 that figure was $496.06 per-share – equivalent to annual compounded earnings growth of 4% on average. Over the same time frame you’ve also seen share price appreciation of around 4% a year on average. In other words your capital gains would have basically entirely matched the performance of the underlying business since the valuation multiple has remained constant. In addition you got about $1,440 per-share in cumulative dividends paid out to you during the period. Assuming the dividends were accumulated in your broker account then that initial $100,000 investment would today be worth $239,950 – equivalent to average compounded returns of 6.7% a year. 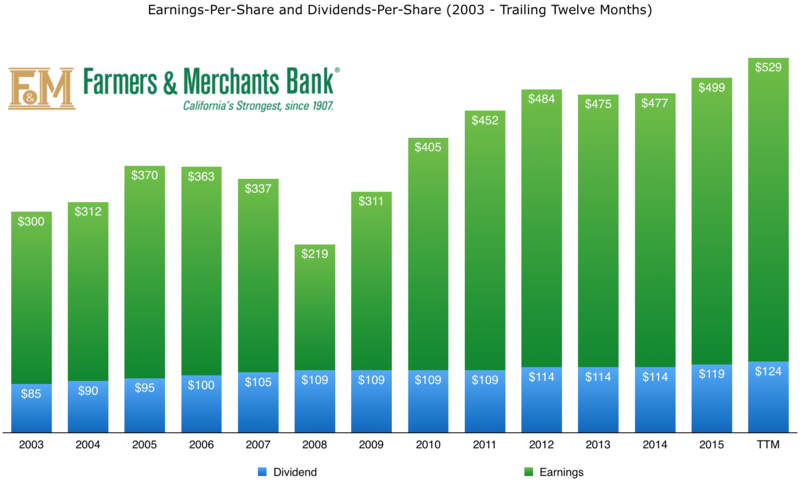 If the dividends had been reinvested along the way then you’d currently have a total of $267,080 in Farmers & Merchants Bank of Long Beach stock. In that case the average annual returns would’ve been 7.5% a year – with a current yield on cost of 5.25% throwing off over $5,200 in projected dividend cash this year. Given where we are with interest rates it’s only normal that the profitability of the bank has been facing headwinds over the past few years. Net interest margins have come under pressure, but they’ve also grown their asset base from $3bn in 2006 to a little over $6bn today. That’s basically what has kept earnings-per-share on an upward trend – albeit a relatively modest one. The stock trades for around 12.5x earnings and 0.9x book value – with returns on equity around the 8% mark (although the could easily be boosted given how much capital they hold). In terms of value that makes it the cheapest of the three Farmers & Merchants banks we’ve looked at. Its shareholder returns aren’t going to set the world on fire relative to the S&P 500, but if you are looking for super high quality bank stock with relatively bullet proof dividends then it’s worth a look.